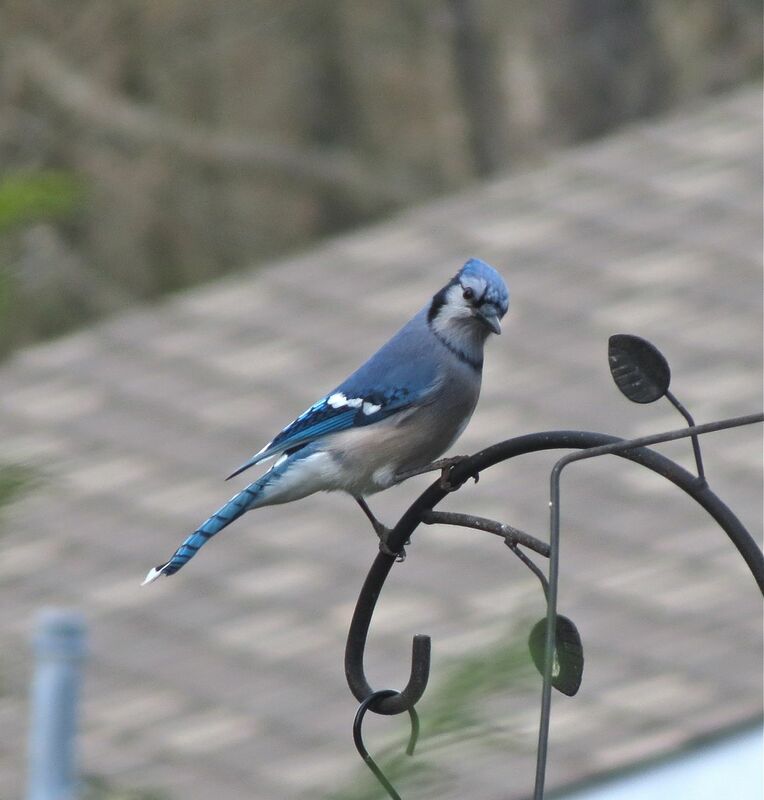 A Blue Jay – the real thing! Around these parts, many people name our local resident jays, blue jays. Birders like me feel a mild, internal cringe at this minor misnaming, but we usually let it pass without comment. After all, our birds are blue, and they’re definitely jays. 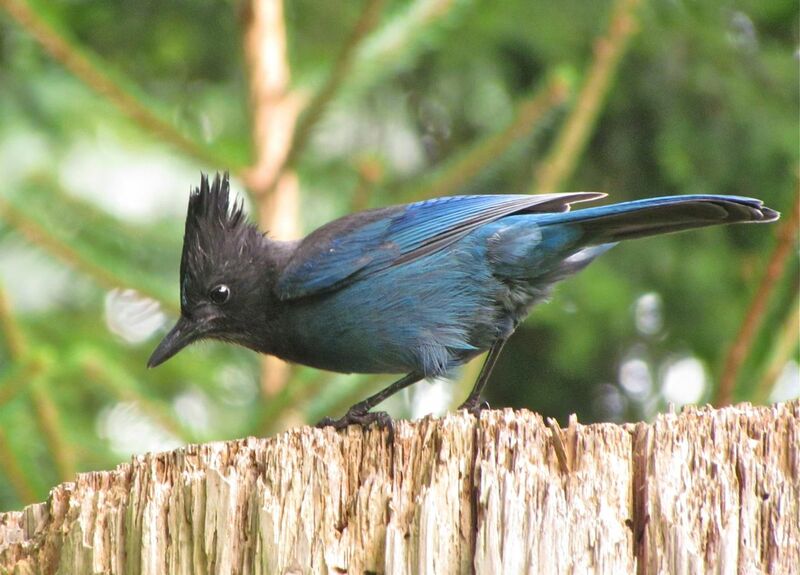 The fairly common blue jay of our coastal forests is of course BC’s Provincial bird, the Steller’s Jay. Loud, brash, and with lots of attitude, it fits in well out here on the “left” coast. Its somewhat shyer Eastern cousin is the real Blue Jay, and we’re incredibly lucky right now to have one visiting a backyard feeder regularly on North Gamma Ave, in North Burnaby. The real Blue Jay is a very rare visitor to the West Coast. Common east of the Rocky Mountains and right across southern Canada, Blue Jays are rare visitors to the Lower Mainland, and as far as I’m aware this is the first one we know to visit Burnaby. It’s certainly a new addition to my list of Burnaby birds. 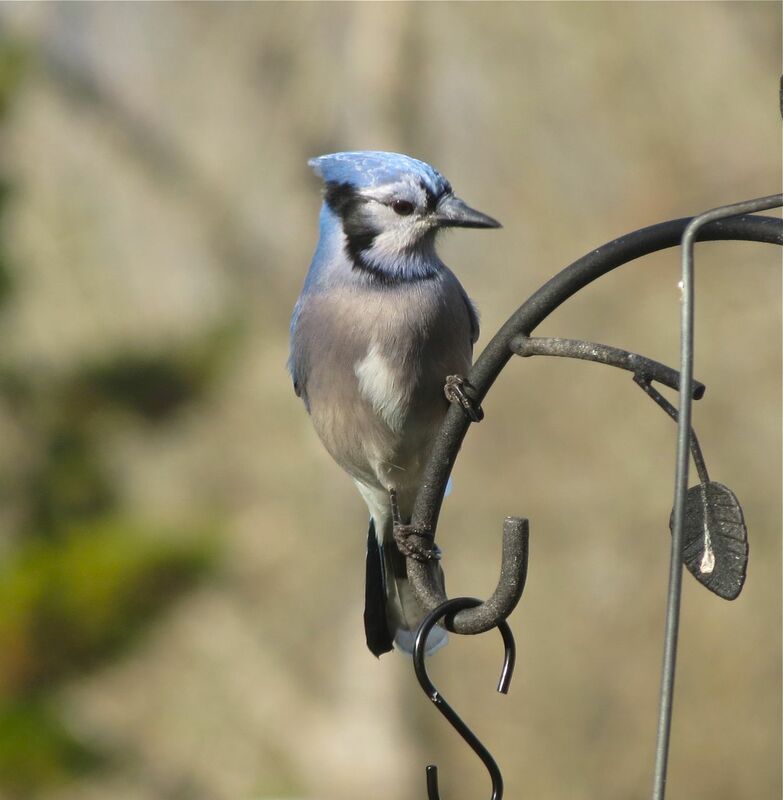 Although rare in our region, Blue Jays are expanding their range in BC west of the Rockies. In fact, there is a second Blue Jay in south Vancouver right now. Two Blue Jays in one winter in this region is exceptional. But let’s enjoy our bird. 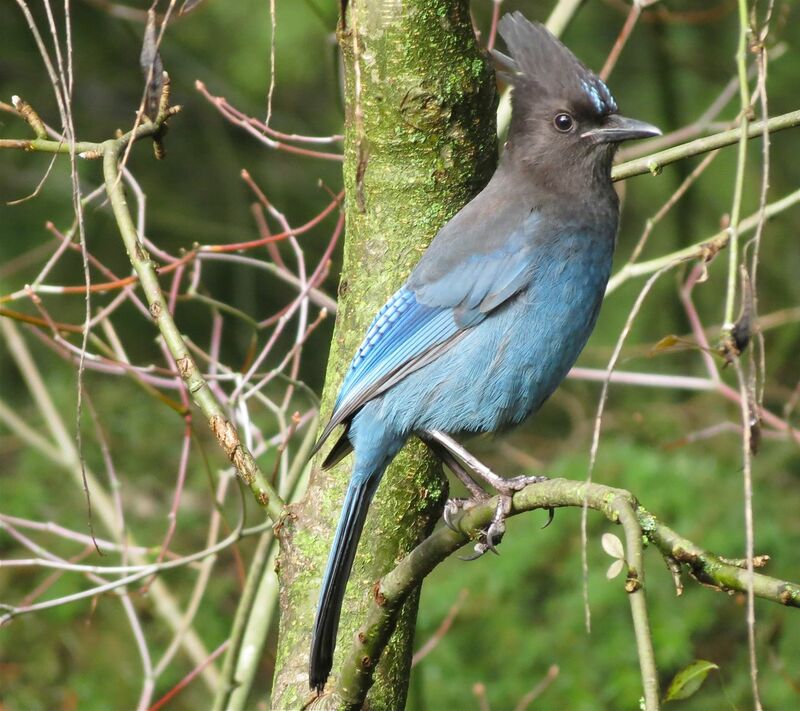 Compared to its cousin (shown below), the much more familiar Steller’s Jay, the Blue Jay’s blue is a lot paler, and the bird is much more boldly marked. Very similar in shape, size and structure, both birds are attracted to bird feeders and have a particular fondness for nuts of all kinds. Both members of the Cyanocitta genus, they are closely related, and where the two species are found together, they sometimes hybridize. Blue Jays sport many more colours than our resident Steller’s Jays. Various shades of blue make a showy contrast to areas of black, white, gray and taup – a handsome bird! While both these birds show quite different shades or colours of blue, their blues have a fascinating connection. For the most part, wherever blue bird feathers are found, including our two jays here, it is not the result of pigmentation. In other words, the feathers are not coloured blue in the way blue jeans are, or blue cars are. At the microscopic level, their feathers have specialized structures that scatter the incoming light to produce the very precise blue colours we see. This is called structural colour. If you found a blue feather from one of these birds and held it up for the light to shine through it, it would look brownish. Here’s to structural colour – our two jays would be a lot drabber without it. Dark blues and black predominate in the Steller’s Jays’ plumage. So, if you’re heading up to North Gamma to look for the bird, focus your efforts north of Cambridge Street. A good clue will be other birders and photographers standing around waiting for the bird to put in an appearance. Another clue to the bird’s presence is its distinctive call. Listen out for it, as this bird frequently announces its arrival before putting in an appearance. And please be respectful of people’s homes and privacy. 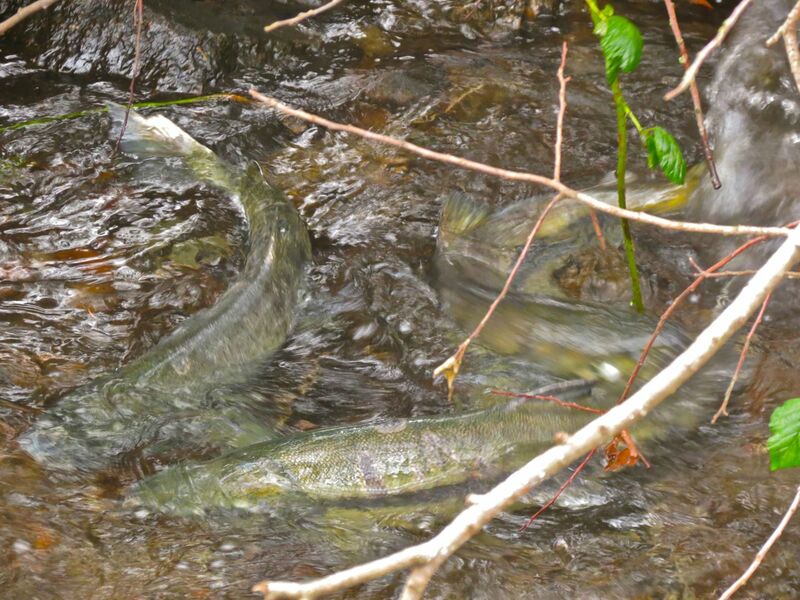 Three of five chum salmon spawning in Buckingham Creek this morning (Nov 6th). After last year’s salmon surprise at Deer Lake, the chum salmon are back again this year attracting the curious, bringing smiles to people’s faces, and causing gasps of excitement. “They’re Back!” Not the return of last year’s fish, of course, but a new run of chum salmon has surged up Buckingham Creek at the east end of Deer Lake, almost to the day they appeared last year. The fish are actively flushing the accumulated silt from their redd (spawning bed) and getting on with the business of producing the next generation. Vigorous body undulations, and splashy tail action cleans out the redd ready to receive the chum salmon eggs. After a fantastic journey to and from the Pacific Ocean where they arrived as smolts, and spent from 3 to 5 years growing to maturity, these fish are returning to spawn in this tiny urban waterway. Last year’s post gave more detail about the journey these fish have made to return here to spawn. Periods of rest separate periods of vigorous activity, perhaps not such a surprise after such a long journey. 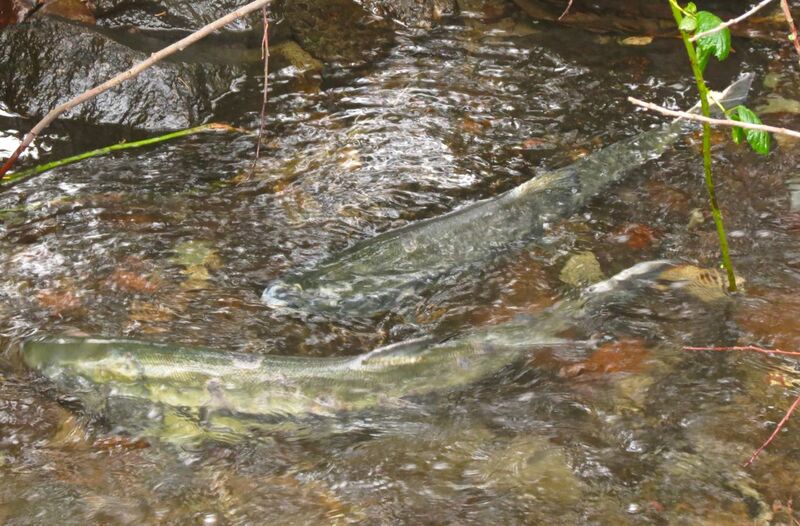 But spawning is a strong urge and the salmon give their all in the final act of reproduction. In a couple of weeks, we’ll see their spent carcasses in the creek. After some energetic gravel cleaning, the fish rest awhile before continuing their spawning. Don’t miss out. Welcome back our urban salmon. The action won’t last for long.